Consumer spending in India is on the cusp of remarkable transformational change over the next decade. The emerging middle class in Indian cities is at the forefront of the anticipated boom. This transformation will create substantial public and commercial opportunities across India for cities to become more integrated in the global economy, enabling sustainable development and greater upward social mobility for Indian consumers. Urbanization can unlock much of India’s vast potential. Cities are perhaps humanity’s greatest economic achievement. They incubate growth by providing density, connectivity, interactions, scale and access to the social and commercial networks that make societies more innovative and productive. India ranks 160th on the United Nations’ list of countries by urbanization levels, with around 34% of its population now living in urban areas. The need for urbanization and its role in the future of consumption in India have been a focus of my collaboration with Bain & Company over the past year, as part of the World Economic Forum Fast Growth Consumer Markets System Initiative. Our own research at Visa also finds great potential in India. In our recent report “The Geography of the Global Middle Class: Where They Live, How They Spend“, Visa and Oxford Economics explore the influence of globalization on the new, more connected middle class that is emerging in cities around the globe. 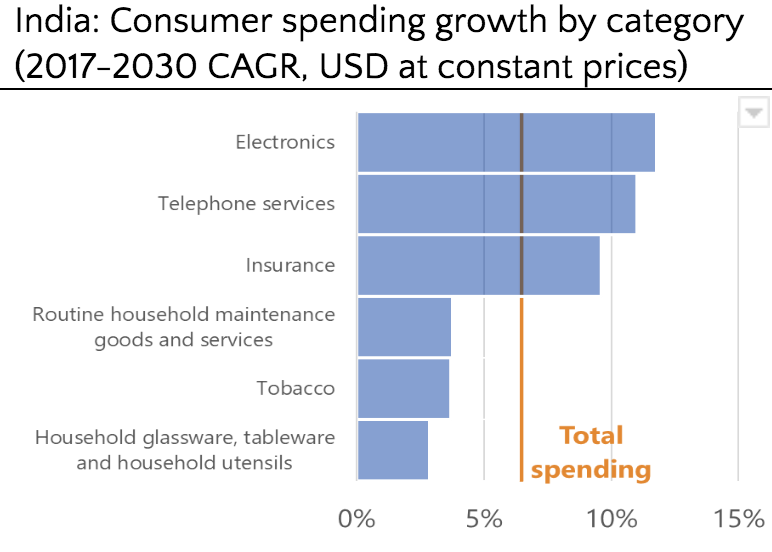 Total consumer spending in India is expected to more than double to $3.1 trillion by 2030, from $1.4 trillion in 2017, according to our research. The new middle class will account for nearly 60%, or $1 trillion, of the $1.7 trillion increase anticipated in India by 2030. India’s economic success goes hand in hand with its increased openness and globalization. While India’s economic opportunity is substantial at a national level, it is even more impressive at the city level. Seventeen of the 20 fastest-growing cities in the world over the next decade will be in India, with Bengaluru, Hyderabad and Chennai among the strongest performers. Agra, home to the stunning Taj Mahal and one of India’s most important tourism centres, is anticipated to have the fastest-growing middle class out of the 103 global cities studied. Agra therefore highlights an important nexus between tourism and urban middle-class household formation, which are two of the five key building blocks of globalization measured under the Visa Globalization Index. Today, Agra is less globalized than counterparts such as Delhi and Chennai, but it could easily close this gap, which would help it develop further and bring more of its citizens into the middle class. The rapid rise and spread of “sharing economy” apps around the world – such as ride-sharing and other services with peer-to-peer business models – epitomize how new technologies, digital payments and globalization can lead to rapid and revolutionary shifts in consumer behaviour. India, which stands at the cusp of new models and platforms for sharing, will advance the sharing economy to an unprecedented level. With a rapidly emerging middle class and more than 1 billion internet users forecast by 2030, “sharing” rather than ownership will likely be the principal model of durable goods consumption going forward in India. These have enabled the dramatic expansion of new consumer-centric commerce platforms and smart cashless cities across India. Digital identification and payments appear to be coalescing in India to provide consumers with a seamless connection to both domestic and international sellers. In 2015, San Francisco was the only city globally where at least 20% of Visa-branded cards were used on a sharing economy platform. In 2017, just one year after demonetization, Bengaluru in India became one of more than 80 global cities to surpass that benchmark. As living standards rise in the more urban and digitally connected Indian cities, consumer spending patterns are becoming more similar to the most global cities in a short amount of time. New middle-class consumers have purchasing power that extends beyond their basic needs. They are willing and able to buy the best the world has to offer. They add amenities to their lifestyles, make aspirational purchases and shop global brands. This will create new opportunities for international businesses, particularly in cities. 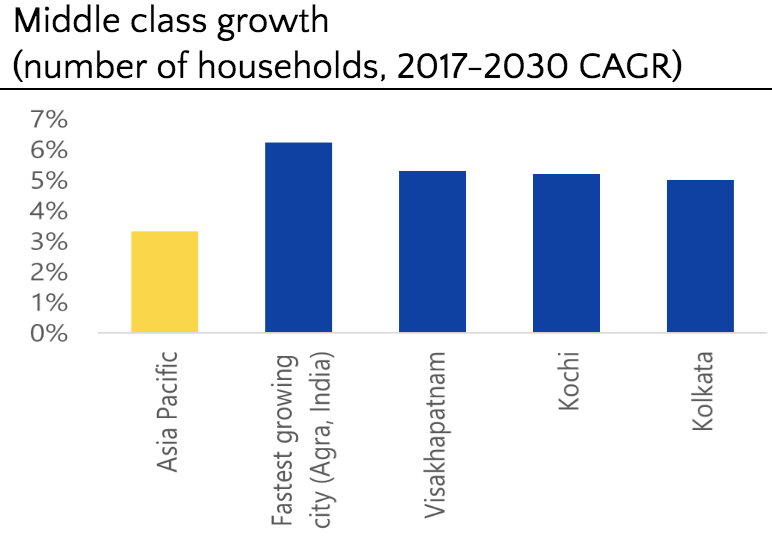 Connected by digital technology that leaps across time zones and language gaps, India’s urban consumers will likely be at the vanguard of the rising global middle class. Understanding these trends can help state and local governments, global and domestic businesses and other stakeholders to plan better for future growth. The consumer spending opportunity in India as a whole is enormous, eclipsed only by the far greater opportunity presented by its cities, as more and more of them join the global economy over the next decade.